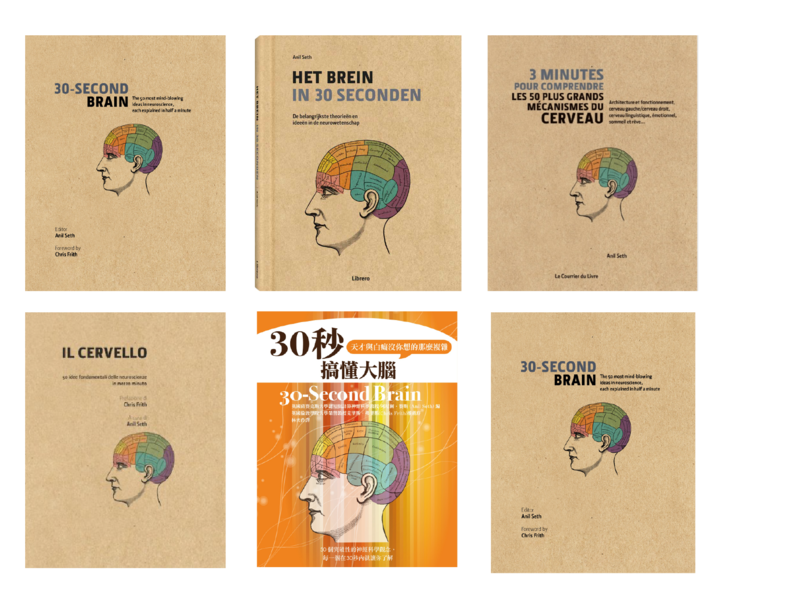 This week I’d like to highlight my new book, 30 Second Brain, published by Icon Books on March 6th. It is widely available in both the UK and the USA. To whet your appetite here is a slightly amended version of the Introduction. Understanding how the brain works is one of our greatest scientific quests. The challenge is quite different from other frontiers in science. Unlike the bizarre world of the very small in which quantum-mechanical particles can exist and not-exist at the same time, or the mind-boggling expanses of time and space conjured up in astronomy, the human brain is in one sense an everyday object: it is about the size and shape of a cauliflower, weighs about 1.5 kilograms, and has a texture like tofu. It is the complexity of the brain that makes it so remarkable and difficult to fathom. There are so many connections in the average adult human brain, that if you counted one each second, it would take you over 3 million years to finish. Faced with such a daunting prospect it might seem as well to give up and do some gardening instead. But the brain cannot be ignored. As we live longer, more and more of us are suffering – or will suffer – from neurodegenerative conditions like Alzheimer’s disease and dementia, and the incidence of psychiatric illnesses like depression and schizophrenia is also on the rise. Better treatments for these conditions depend on a better understanding of the brain’s intricate networks. More fundamentally, the brain draws us in because the brain defines who we are. It is much more than just a machine to think with. Hippocrates, the father of western medicine, recognized this long ago: “Men ought to know that from nothing else but the brain come joys, delights, laughter and jests, and sorrows, griefs, despondency, and lamentations.” Much more recently Francis Crick – one of the major biologists of our time – echoed the same idea: “You, your joys and your sorrows, your memories and your ambitions, your sense of personal identity and free will, are in fact no more than the behaviour of a vast assembly of nerve cells and their associated molecules”. And, perhaps less controversially but just as important, the brain is also responsible for the way we perceive the world and how we behave within it. So to understand the operation of the brain is to understand our own selves and our place in society and in nature, and by doing so to follow in the hallowed footsteps of giants like Copernicus and Darwin. But how to begin? From humble beginnings, neuroscience is now a vast enterprise involving scientists from many different disciplines and almost every country in the world. The annual meeting of the ‘Society for Neuroscience’ attracts more than twenty thousand (and sometime more than thirty thousand!) brain scientists each year, all intent on talking about their own specific discoveries and finding out what’s new. No single person – however capacious their brain – could possible keep track of such an enormous and fast-moving field. Fortunately, as in any area of science, underlying all this complexity are some key ideas to help us get by. Here’s where this book can help. Within the pages of this book, leading neuroscientists will take you on a tour of fifty of the most exciting ideas in modern brain science, using simple plain English. To start with, in ‘Building the brain’ we will learn about the basic components and design of the brain, and trace its history from birth (and before! ), and over evolution. ‘Brainy theories’ will introduce some of the most promising ideas about how the brain’s many billions of nerve cells (neurons) might work together. The next chapter will show how new technologies are providing astonishing advances in our ability to map the brain and decipher its activity in time and space. Then in ‘Consciousness’ we tackle the big question raised by Hippocrates and Crick, namely the still-mysterious relation between the brain and conscious experience – how does the buzzing of neurons transform into the subjective experience of being you, here, now, reading these words? Although the brain basis of consciousness happens to be my own particular research interest, much of the brain’s work is done below its radar – think of the delicate orchestration of muscles involved in picking up a cup, or in walking across the room. So in the next chapter we will explore how the brain enables perception, action, cognition, and emotion, both with and without consciousness. Finally, nothing – of course – ever stays the same. In the last chapter – ‘the changing brain –we will explore some very recent ideas about how the brain changes its structure and function throughout life, in both health and in disease. 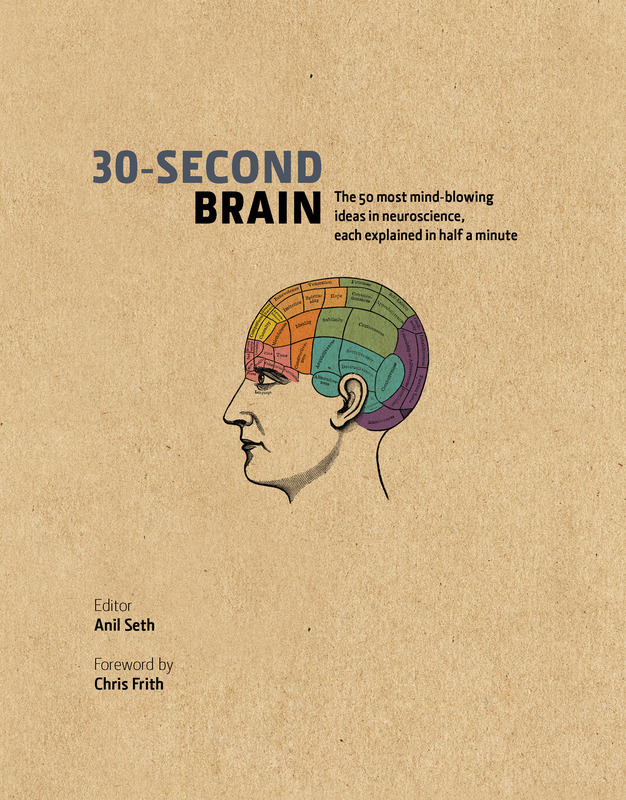 Each of the 50 ideas is condensed into a concise, accessible and engaging ’30 second neuroscience’. To get the main message across there is also a ‘3 second brainwave’, and a ‘3 minute brainstorm’ provides some extra food for thought on each topic. There are helpful glossaries summarizing the most important terms used in each chapter, as well as biographies of key scientists who helped make neuroscience what it is today. Above all, I hope to convey that the science of the brain is just getting into its stride. These are exciting times and it’s time to put the old grey matter through its paces. Update 29.04.14. Foreign editions now arriving! Since this is a new blog, forgive a bit of a catch up. This is about a recent Trends Cognitive Sciences opinion article I wrote, applying the framework of predictive processing/coding to interoception, emotion, and the experience of body ownership. There’s a lot of interest at the moment in understanding how interoception (the sense of the internal state of the body) and exteroception (everything else) interact. Hopefully this will contribute in some way. The full paper is here. ABSTRACT: The concept of the brain as a prediction machine has enjoyed a resurgence in the context of the Bayesian brain and predictive coding approaches within cognitive science. To date, this perspective has been applied primarily to exteroceptive perception (e.g., vision, audition), and action. Here, I describe a predictive, inferential perspective on interoception: ‘interoceptive inference’ conceives of subjective feeling states (emotions) as arising from actively-inferred generative (predictive) models of the causes of interoceptive afferents. The model generalizes ‘appraisal’ theories that view emotions as emerging from cognitive evaluations of physiological changes, and it sheds new light on the neurocognitive mechanisms that underlie the experience of body ownership and conscious selfhood in health and in neuropsychiatric illness. As always, a pre-copy-edited version is here.